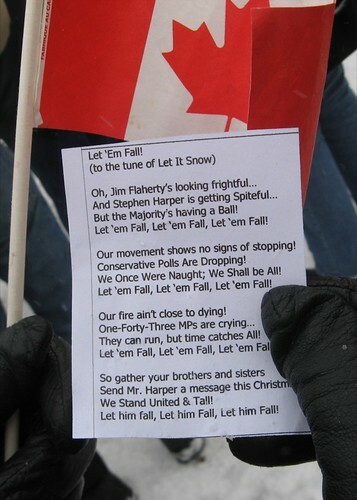 Let 'Em Fall (Sung to the Tune of "Let it Snow") - From Pro-Coalition Rally in Peterborough, Ontario, originally uploaded by Ann Douglas. We sang "O Canada" in English as well as in French -- and we also sang this alternative carol -- to the tune of "Let it Snow." You have to be an enthusiastic singer if you're going to come out to a political rally in Peterborough.